Remote Update Tool for developers and administrators. Users don’t need neither to check update manually nor to run a special updater. 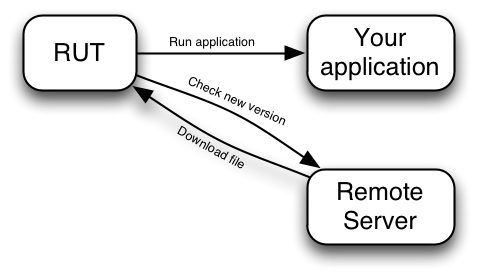 RUT works as a launcher of your application, it’s an entry point of your application. User starts RUT, it checks if the update is available and downloads it if any exists, then runs your application. When you created new version of application, put txt file with last version and application on remote server. Now, user runs RUT, current and last version are being compared, if the versions are different, update will be downloaded. After that, special command (which you defined in settings.xml) will be invoked, it can start either application or any other commands. RUT has 2 modes: console and Swing GUI. Windows version runs in GUI mode by default. current-version: Current version of application on client computer, changes automatically after updating. remote-version-file: Txt file, which contains last version of application (e.g. 0.2) on remote server. remote-file: File on remote server, which should be downloaded in the updating process. run-command: Console command, which will be invoked after updating, e.g. it can run the downloaded file. http://example.com/version.txt contains “0.2” (without quotes). After updating, current-version changes to 0.2 and file.jar runs.